Join us for Demo Day April 19! Join us at Severn Sailing Association for Demo Day, where we showcase the one-design sailing fleets at SSA. This event is free and open to the public. We welcome everyone from experienced sailors to people interested in learning to sail. 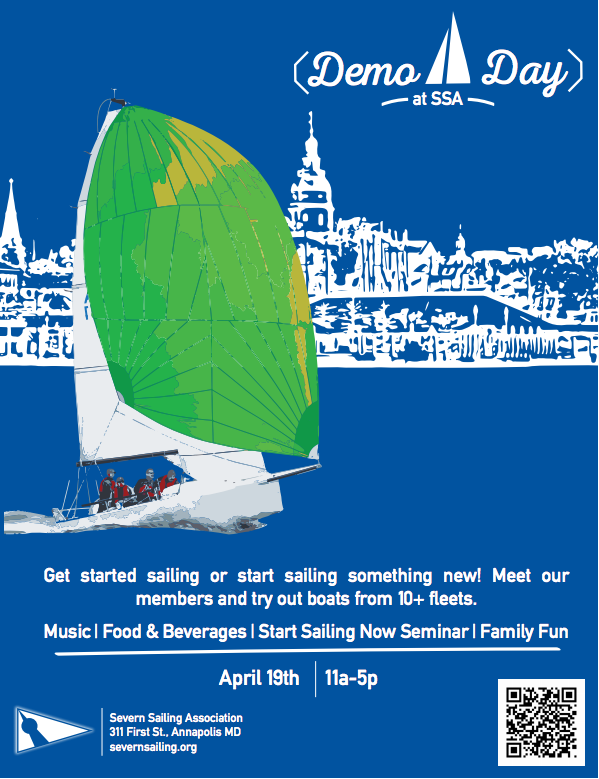 For those who are interested in learning to sail, SpinSheet will sponsor “Start Sailing Now,” a seminar designed to show you how to get started sailing, that will run 2-3 p.m. For those with sailing experience, this is a chance to sail different kinds of one-design boats and meet with owners and fleet captains. Throughout the event, we’ll have music, food, and beverages. Make sure to dress appropriately for the weather and for sailing, and bring a life jacket if you own one.